If you study the Iroquois, you have come across the work of the pioneering anthropologist Lewis Henry Morgan. He published in the middle of the nineteenth century The League of the Ho-dé-no-sau-nee or Iroquois. It is an important book. Though many of Morgan’s findings have been rejected, there is no doubting the significance of the work. His ties to the Parker family at Tonawanda gained him extraordinary access at a period when many Americans still anticipated that the Iroquois, like other Native American peoples, would disappear. Morgan’s Rochester ties are deep. 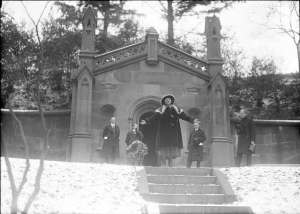 He lived in town, left his papers to the University of Rochester, and for years his grave in Mount Hope Cemetery became a pilgrimage site for Iroquois leaders and activists. 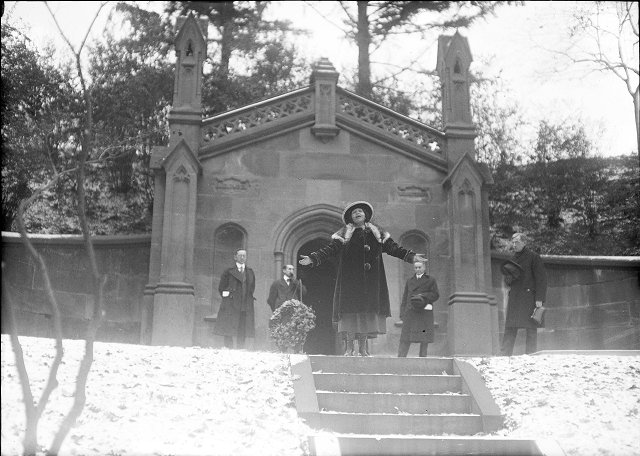 In this picture, taken in 1920, Oneida Elsie Elm sings a funeral dirge at his grave site. George Decker, the Rochester attorney who represented the Oneidas, and who helped in the attempt to take Levi General’s (Deskaheh) complaints about Canada’s treatment of Haudenosaunee at Grand River before the League of Nations in Geneva, stands farthest to her left. The Seneca Arthur Parker, another force in Haudenosaunee anthropology with whom we must contend, stands to her left. The Oneida William Rockwell and the Mohawk Louis Bruce are also pictured. The University of Rochester is hosting events to commemorate the bicentennial of Morgan’s birth, and has recently launched what I expect will become a fantastic digital humanities project focused on Morgan’s life and career, and its significance. You can take a look at the website here. It looks fantastic. A couple of weeks ago, I was chatting with Robert Foster, Professor of Anthropology of UR and the director of the Morgan project. 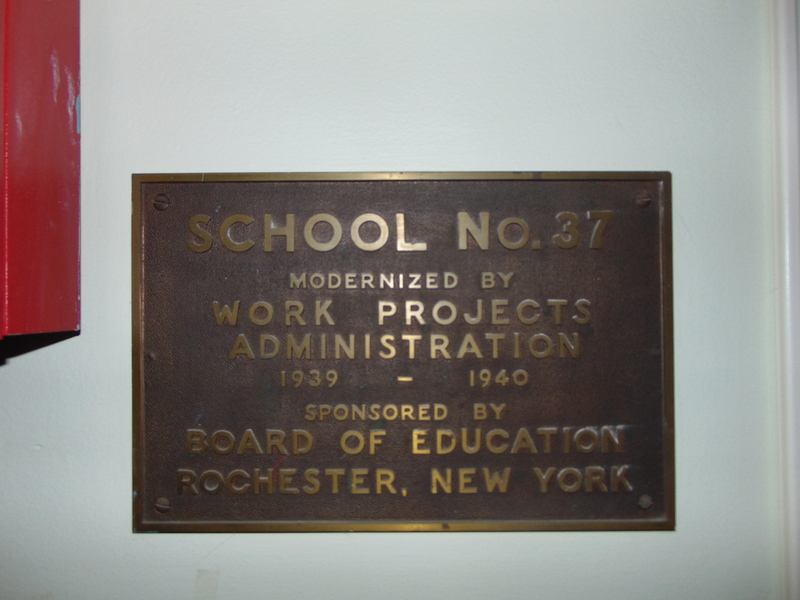 He indicated that there had once been a school in the Rochester City School District named after Morgan. Bob had heard that the school’s auditorium was decorated with Haudenosaunee themes, though he had not yet seen them himself. I did some poking around. It took only a minute to find out that the school had been recommissioned as a charter school, Number 10, the Dr. Walter Cooper Academy School. A couple of phone calls, and thanks to a welcoming staff, I was able to take some pictures of the auditorium. My students have no sense of how much the WPA did, and how much government can do. 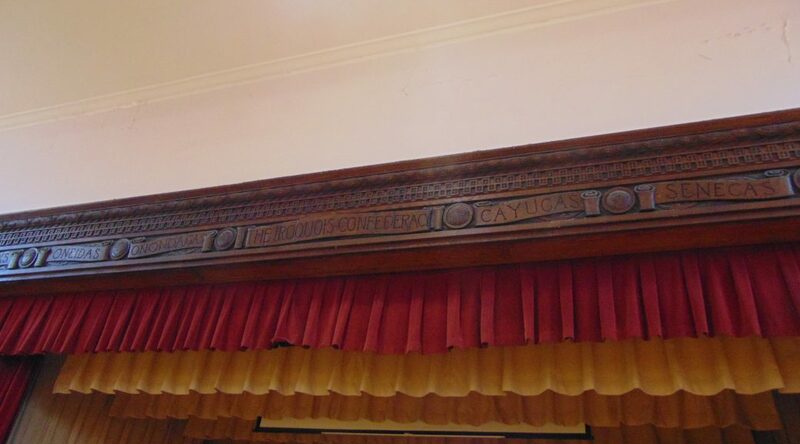 The woodwork above the stage includes the names of the Six Nations. The placement of the Mohawks far to the left and Senecas and Tuscaroras to the right makes sense when one appreciates that I was facing South when I took this picture. The vertical posts are fashioned to look like trees, with beavers at the bottom of each. 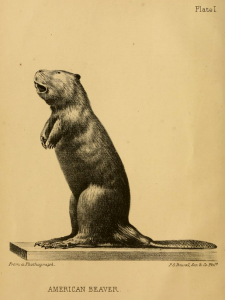 Morgan wrote a study called The Beaver and His Works. Running along the top above the names of the Six Nations is woodwork, I assume, designed to look like wampum. According to Ivan, the custodian who allowed me access to the building, the auditorium is scheduled to be remodeled. The stage will remain, and the room will be transformed into the school library. The plans at this stage include a replica longhouse to be built into the library design. Everywhere one goes, you see see evidence of erasure. Non-native Americans, in my experience, are uncomfortable talking about the violence of the past, the totality of that dispossession. Native peoples, when they are considered in public schools, are cast as part of the past. The images and motifs present in the old Lewis Henry Morgan school auditorium do that as well. But they also provide an opportunity to talk about that history, and I was pleased to see that the Walter Cooper Academy plans on keeping them as they move forward with renovations. The school staff with whom I spoke were proud of the room. I could tell that when I visited. The University of Rochester will be hosting events over the course of this year. You can find out more about those events here. I have many questions concerning this beautiful stage at LHM #37 school, now #10 school. I have done some research , including the RSD, Rundell library and a contact @ the U of R and no one seems to have answers. At your convenience would you please provide some deeper information? I would like to learn whatever history on the woodwork and artist who completed this work. I know of Mr. Morgan’s interest in Native Americas, especially NYS tribes, however, the history of how #37 was adorned with such beauty is lacking. I am hopeful you might shed some insight. Thank you kindly. I wish I knew the answer to these questions. There is a plaque at the entry to the school indicating it was a WPA project, I believe, but I do not know more than that. 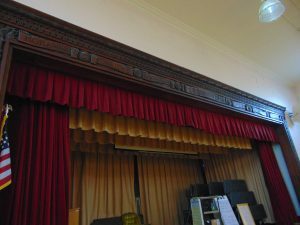 The custodian at the school told me they are planning to incorporate some Native American themes into that room during the remodel–leaving the stage woodwork, of course, but adding a longhouse and other instructional matter for the students. Wish I could tell you more. It is indeed an interesting question. Thank you for provided some insight to my question. 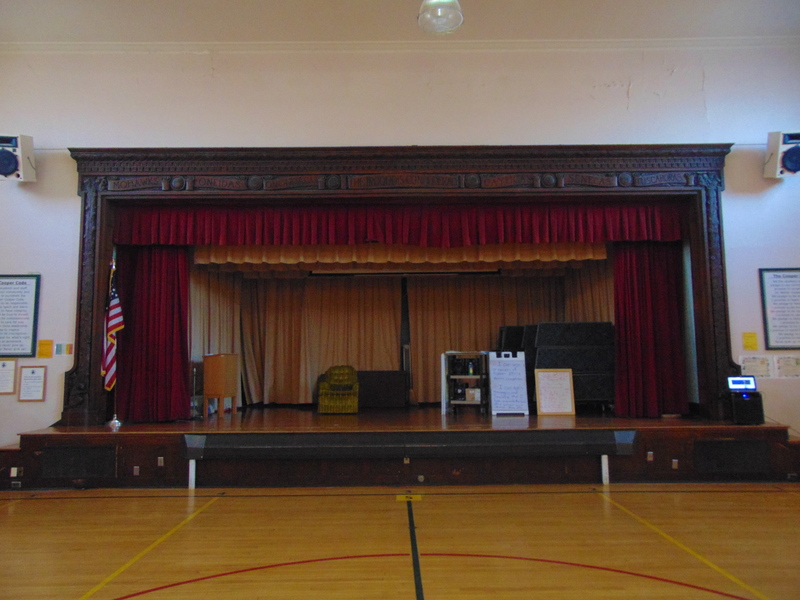 I will try to contact someone @ WPA and see what they can tell me about the stage woodwork @ Lewis H. Morgan school. Happy to hear it will remain in place, it has always been such a beautiful piece to look at, my grade school in the early ’50’s.